The Sicilian Pizza ($6.45) was topped simply with ham, red peppers and mozzarella cheese and the Calzones were fried and stuffed with mushrooms, ham and red peppers. 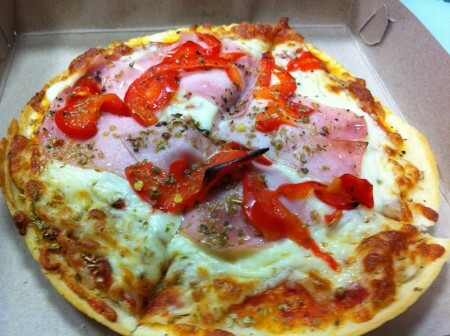 The Sicilian was on a thin crust and tasted great but as a warning to hungry people – it was a smaller portion. The Calzone was heartier and was served with an unbelievable marinara sauce. Everyone in our group dove into the marinara and agreed it was the best they’ve ever had. Check out Rotisserie Italienne if you’re in the area – they also have a big screen for watching the Habs games if you’re into it. Tags: Calzone, Italian, Montreal, Pizza.